The GLL Community Foundation is here to support projects which encourage local people to be active, learn and play together– it could be organising a sporty tournament, improving a community library or creating a new sports league. Upload your project idea now for the chance to get a pledge of up to £5k. GLL is charitable social enterprise that manages leisure centres, libraries and other community services. We aim to help everyone in our local communities to be able to enjoy educational, sport and play activities. We want all members of the community to benefit from projects that improve health and wellbeing. As the UK’s leading leisure charitable social enterprise a lot of the work GLL do is about making communities better for everyone. We truly believe that together we change lives for the better, and are committed to demonstrating this on a larger scale than ever before. Get people active - whether it's revamping a playground to keep the kids fit, installing a zip-wire across your park, or closing your high street to hold a mini Olympics! Projects must have a civic value, meaning the benefit should be felt in the places we share, rather than our private homes and offices. Projects can be permanent (like a new cricket cage) or temporary (like an event) and they can include revenue as well as capital costs. 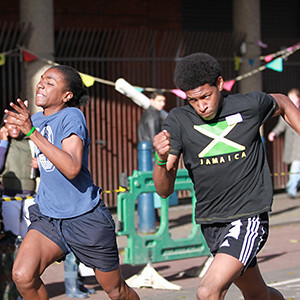 Brixton Bolt: A fun race day to find out who were the fastest men, women, and children in town! 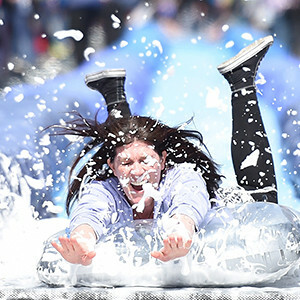 Park and Slide: A temporary giant water slide down the high street! 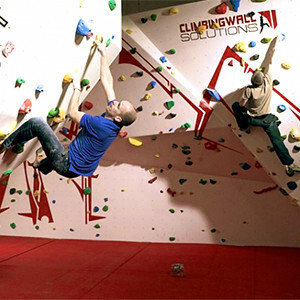 Build a Bouldering Room at Minehead EYE: A facility revamp, making locals fit and happy! 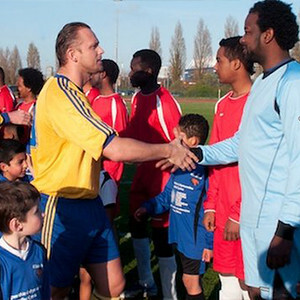 Cardiff Community Cohesion Cup: A tournament that built relationships between nationalities! 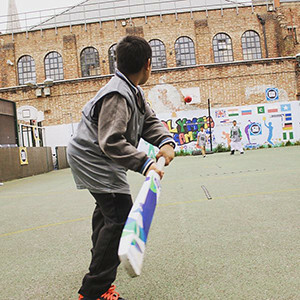 Cage Cricket in SW1: A cricket cage for all to enjoy! 3. Pitch to funds. If you meet the criteria of our funding partners, you will have the opportunity to pitch for a pledge. Make sure you submit your pitch before applying for verification. ​​​​​​​4. Get verified. Before you can start fundraising, your project details will be verified by an independent organisation - Locality. 7. Make it happen! Our team will be on hand to help you through this and offer support as you deliver your project. Wishbone presents "Mountain High Valley Low" - ten free performances of an original theatre show created especially for Finsbury Leisure Centre. We'll tell the story of Josie, a woman who’s looking for love but has a secret to hide. Josie is affected by bipolar disorder. Her answer is to take up long-distance cycling and dating. Things may not go totally to plan… With an original soundtrack and visual projections mixed live, you can ride along with Josie from Islington into the countryside through the shifting seasons and the emotional landscape of her mind. To develop the show, Wishbone will put together professional artists and a group of Islington residents who live successfully with the serious challenge of bipolar. Together, we'll collaborate to create a true-to-life, immersive experience for the audience. There'll also be opportunities for Islington residents to benefit from free led cycle rides and free creative workshops, co-designed with our local wellbeing heroes. This project proposes to buy land in the first phase of our overall project. In the second phase we will develop a small scale community gym and bike repair workshop on a currently unkempt brownfield site in Lord Street. We have successfully gained funding from the Urban Village fund for this. The land purchase was not included in this overall funding and the local group would like the community to help support this purchase. As little as £2 could go a long way in securing this land for the project. Thank you! This project will provide a shared space and help to develop community facilities that can be used to bring a diverse range of community organisations and individuals together through an innovative health & wellbeing and personal skills development programme of activities. Transform and rejuvenate St Andrew's Church gardens into a tranquil green space at the very heart of Rugby town. The gardens are already central to many town festivals and celebrations, for example, the annual Food and Drink Festival but are overgrown, a little tired and can suffer with anti-social behaviour. We pledge to: 1.Reduce and replenish current planting: making more space for community events; a flagship bee friendly garden, whilst improving sight lines, with the aim of reducing anti social behaviour in the centre of town. 2. Co-curate the space with users, installing a water fountain, charging points and a story telling chair. 3. Protect the current memorial garden by developing a community-driven arts commission, with new seating, offering a safe refuge for reflection. By pledging a minimum of £150 you can have a loved one's name included and remembered in the memorial - for more details and to confirm your pledge please contact events@rugbychurch.org.uk.